Serena Williams serves during her ladies singles first-round match against Kristýna Plíšková of the Czech Republic during day 3 of the 2018 French Open in Paris on May 29, 2018. She’s baaaaaaack. 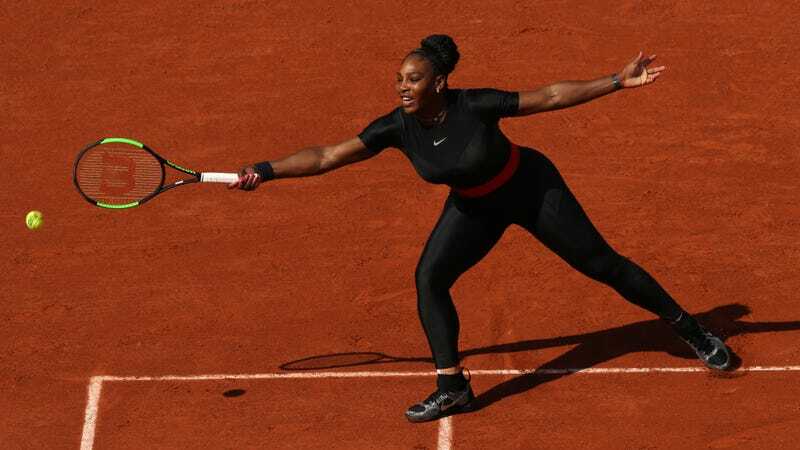 ... Serena Williams on Tuesday proved her bounce-back complete after the difficult birth of baby Alexis Olympia by winning her first grand-slam match at this year’s French Open, beating Czech opponent Kristýna Plíšková 7-6(4), 6-4. I call it, like, my Wakanda-inspired catsuit. ... We designed it way before the movie, but still, it kind of reminds me of that. ... I’m always living in a fantasy world. I always wanted to be a superhero, and it’s kind of my way of being a superhero. Williams is certainly a superhero in our estimation, not only for winning 23 grand-slam titles—her last while pregnant—but for working on her 24th within a year of the life-threatening delivery of her first child, during which she suffered a pulmonary embolism that was nearly overlooked by hospital staff. I had a lot of problems with my blood clots, and, God, I don’t know how many I have had in the past 12 months. So it is definitely a little functionality to it. ... I have been wearing pants in general a lot when I play, so I can keep the blood circulation going. It’s a fun suit, but it’s also functional, so I can be able to play without any problems. It feels like this suit represents all the women that have been through a lot mentally, physically, with their body to come back and have confidence and to believe in themselves ... I definitely feel like it is an opportunity for me to inspire a whole different group of amazing women and kids.